In Oslo police arrested 27 after hundreds of pro-Hamas thugs attacked a pro-Israel rally at the Parliament building. Oslo police detained at least 27 people on Thursday after pro-Israeli and pro-Palestinian demonstrators clashed in one of the worst such outbursts in the Norwegian capital since the 1980s. Shop windows in the city centre were shattered and police repeatedly used teargas to break up groups of activists demonstrating over Israel’s crackdown in the Gaza Strip. The violence started when about 1,000 pro-Palestinian supporters showed up at a rally sponsored by Norway’s largest opposition party in support of Israel. Television pictures showed they burnt Israeli flags and threw projectiles at police clad in body armour who separated the two groups. “This has nothing to do with the situation in Gaza,” Johan Fredriksen, chief of staff of the Oslo police, told the website of the daily Aftenposten. “These people came to the protest with knives, bats and Molotov cocktails,” he said, speaking about the pro-Palestinian side. “You have to go back to the early 1980s to find a similar situation in Norway,” Fredriksen said, adding that police were still concerned about security across the city. 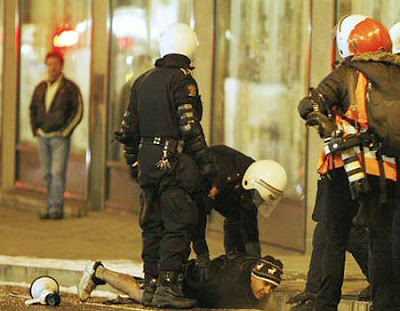 Clashes also took place near the Israeli embassy. Around 500 people who had gathered for a legal demonstration in support of Israel outside the Norwegian parliament were attacked Thursday evening by some 1,000 pro-Palestinians, police told AFP. “Almost immediately there was a large degree of aggression from the counter-demonstrators,” Johan Fredriksen of the Oslo police said late Thursday. 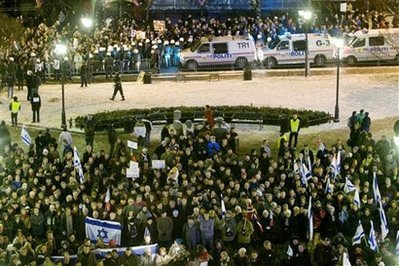 Aljazeera reported that 40,000 protested in Oslo on Thursday in support of the radical Islamists. 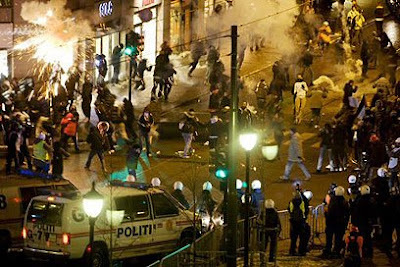 VG Nett has several photos from the rioting in Oslo.